Much of Dijon’s historic city centre is a pedestrian area, and you’ll often find it’s only a short walk from one part to another. For longer distances, trams, the bus network, and a free shuttle bus service in the historic centre are operated by DIVIA. 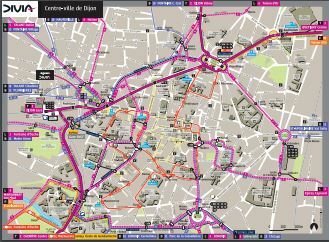 Links to the latest pdf maps of Dijon’s bus and tram routes (updated annually) can be found on the DIVIA website. Click the map image below and then choose either the city centre transport map (Plan du centre-ville de Dijon) or the Plan Geographique du Reseau Divea for a bus map that includes the whole city and some nearby communes. There’s also a schematic map of the entire public transport network if you prefer the diagramatic format.